Offering you a complete choice of products which include double tube end chamfering and length measuring machine and double blade sawing machine. With the SOCO FM series for Chamfering + Length Measuring, it is possible to simultaneously chamfer both ends of a tube, with up to 3000 mm in working length and measure their lengths with tolerances as low as +1-0.02 mm. With an optional BTM (Bundle Loading Magazine), the machines offer a completely automatic loading, feeding, chamfering and length measuring Processes. Using an absolute length measuring system (against a calibrated piece), the machines may also be programmed to stop after a certain number of pieces do not fall within the specified length tolerance. Programmable Rejection Rates - the operator may choose for the machine to stop after a certain number of pieces (continuous or separate) does not fall within the specified length tolerances. Ability to inside + outside ( 1/0 ) chamfer as deep as 15mm or angles as small as 15 degrees. The "Walking Beam" system ensure that the work pieces are not damaged or scratched through the entire machining process. We are an acclaimed name in the market, engaged in offering a superior quality array of Double Blade Sawing Machine. The machine is appropriate for the entities that require cutting of bulk pipes, parts, metal sheets and other hard engineering components. This machine has good rigidity, optimum strength, better precision, easy operation, and adjustment scheduling solutions. Also, the higher methods are used in producing machining and cutting. 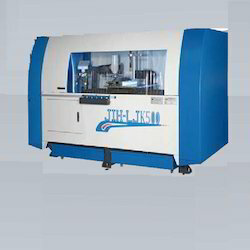 In addition, the machine can be configured according to the requirements of clients. 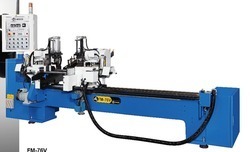 Looking for Double Blade Sawing Machine ?